Jimmy Fallon took over the reins of The Tonight Show last night. At first, I was sure I would not be able to stay up and watch because I hadn’t slept the night before but hooray for a second night of insomnia! I have an unreasonable love for Jimmy Fallon. I think he is a hoot and I love the creativity and fun he brings to whatever he does. But last night I was reminded that I also appreciate the man that he seems to be. The show opened with him genuinely thanking those who came before him, those who journeyed with him, and those who stood by him today. It wasn’t a sappy outpouring but seemed to reflect his gratitude for all that he has been blessed with and his knowledge that he hadn’t gotten to this place, this show, this pinnacle of television success, without the support of so many people. And then he made a promise to work hard every day to ensure that when you watch The Tonight Show, you go to bed with a smile on your face. That really struck me and I so appreciate the sentiment. How many nights do you climb into bed and replay the events of the day on an endless loop? And how many days is that loop full of the things that went wrong, the situations you wished you’d handled differently, the words you wish you’d said or wished you could take back? How many nights does the ever-growing to do list swirl in your mind, along with your inner critic trying to convince you that there is not enough time, there aren’t enough resource, that YOU aren’t enough? But what if you didn’t let that happen? What if you wrote out your to do list and got it out of your head? And what if you told your inner critic to quit it and you turned off the endless loop playing in your head? 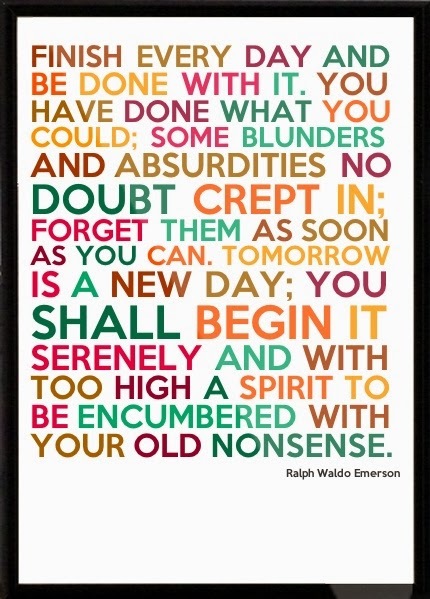 What if, instead, you simply thought of this quote I love from Ralph Waldo Emerson, watched a little bit of The Tonight Show, and went to bed with a smile? ← Pain Makes You Beautiful? I DVR'd it and just finished watching. Like you, I hope he's the class act he seems to be. I appreciate people who remember where they came from and that it could go away at any time. After watching, I put the show on my permanent DVR list. He made good on his promise—I really had a smile watching the show. I hope he is, too – it certainly seems that way. And I'm looking forward to more smiles in the weeks to come. This is fantastic! I think I'm going to put that quote on one of the bedroom walls!